water sports.We rent Saturday to Saturday. We had rented on Walloon . Purchased a cottage in1982 . on this site Built the log in 2009 and finished in 2010 where the original cottage was. Love this lake . Great fishing and boating. Close to Petoskey with great shops, dining and playing. our parents had a home on Lake Charlexoix for many years. We loved the area growing up and spent lots of summers here. It will spoil you . You have to return. large baths, 2 baths have Jacuzzi tubs with shower; One bath has a double head walk in shower. off the down master bedroom. There is a large walk in closet down. We also have a hot tub for adults. in a separate room. The great room has a leather sectional that sits 7-8 and 2 recliners. in front of the wood burningfireplace. We have lots of wood. We have double convection ovens .Lots of pots and pans. we have a gas grill outdoors. there is mixer, blender for your use plus a griddle for pancakes. We have a shuffle board and bumper pool Badmitten, Volley Ball. croquet set. We have a built in Bose on themain floor. In door hottub spa. for adults. Quiet setting with large deck overlooking lake. 1.5 acre grassy yard with shallow swim beach. 24 foot sand box for children. Firepit, 50 foot dock, 2 car garage. Luxurious home with 5 bedrooms sleeps 12. Hardwood floors throughout with three and a half ceramic baths. Jacuzzi tub and separate hot tub room. Large granite kitchen with all appliances. Beautiful stone wood burning fireplace. Log interior with outdoor decor including, antler chandeliers. Entire front of home is glass overlooking Walloon Lake. 40 foot great room has 4 sliding doors to lake front. We just returned from the best family vacation ever. Mom and Dad, four adult children with spouses and a grandson just returned from a week on Walloon Lake at the home of Barb and Booth Browne. This sprawling new log home with 5 bedrooms, 3 ½ bathrooms and numerous living areas was the hub for our family activities. On the east arm of Walloon Lake, the views are super. Everything is open, spacious and warm. The large kitchen is a significant plus when 11 people want to eat. A sandbox was the personal delight of our 3 ½ year old grandson – until we discovered the very large sandbar about a mile away. Pure sand and water no higher than mid-shin… Water was warm and the weather was great all week – a big plus. Back to the home… You can walk two football fields into the lake in front of the home – some rocks and a little murky when boats are churning the water...Talk about a great place to lie in a tube… And let us not forget to mention the large firepit that was the hit for many a late evening around the fire. The wrap-around deck is huge and accommodating for sun or shade. A large grill - very clean – was available in the attached garage. Close to Petoskey, you can find casual or fine dining, a great State Park and lots of shopping. Walloon Village is even closer with a great restaurant above the marina. You can’t go wrong with a family vacation at this home. Remarkable how similar our review is with the other one. While we loved the house, everything else about it left much to be desired. - The hot tub that was advertised had been "hit by lightning" and was not usable for the duration of our visit. Maybe so, but, given everything else, I am not sure if this was true. - Walloon is a great lake, but, the water down there is pretty murky and shallow. Not much room to dock a boat. - the pontoon boat that you can rent from them is pretty old and ricketty. I'm guessing that these people rent this place to earn a few extra bucks in their retirement. This is probably their dream home and they probably love the place to death (it is nice). . . but, it seems they just aren't the kinds of people to rent a home, because they are not happy with people using their property. . . and they want to try to stick you for as much as you can. I'd avoid this place. Renters Beware.... We rented the log home and the small cottage for a family of 15. Grandparents stayed in small cottage and the rest of us stayed in the Log home. The cottage was clean but extremely run down and out dated. The carpet inside the cottage is orange sculptured from the 70's and appears not to have been cleaned in years. Furniture/ furnishings inside the small cottage are also very dated(not antique). While everything functions its very outdated and uncomfortable to enjoy spending any time. 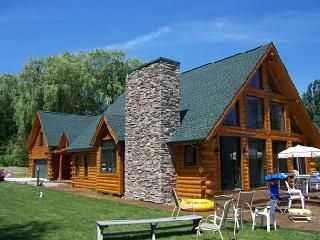 The Lodge was completely adequate for our large group of 6 adults and 6 kids (ages 10-19). The photo's don't due the place justice, literally. There is a large 1,000 sq.ft. loft that's not seen in photo's that has 2 sets bunks, futon, comfy furniture and a large tv for the kids to all hang out in. There is another seating loft over the great room/kitchen that has a comfy sofa,chairs and another large flat screen tv. Upstairs also has 2 queen bedrooms which share a bathroom that has a shower head 4 1/2 feet from the floor (same in the small cottage) so you you have to do yoga back bend to shower. Main floor has a large great room with beautiful stone fireplace, comfy seating, 2 large dining tables and a tight galley kitchen stocked with misc. kitchen utensils from the 70's & 80's. Kitchen is functional but lacking organization and quality. Laundry room has washer/dryer but renters are not allowed to use washser because of their tile field is inadequate to handle using a washer for a home you are paying a lot of money for a week/sleeps 12. There is also 2 master suites downstairs with queen beds & en suite bath. Outside is a deck with run down table and chairs, fire pit, old dirty grill,sandpit, a retaining wall in need of major renovation and an amazingly beautiful lake. With all that said we had a great time in a beautiful "Log Home" in need of some major TLC. It met our needs and the Walloon Lake made it all worth it. Be aware that your cleaning fee's could be an excessively high amount that you find out about after you vacation is over and you call to see about your security deposit refund. above and beyond. We have never had a complaint from our guests. Everyone have been most satisfied with all the amenities we provide such as 2 large screen tv's. Boss surround music system, cable , internetand new hot tub. The log was built in 2009 and newly furnished at that time. The quest cottage was up=dated in 2010 and is only used 4-5 weeks during the summer. The above mentioned quest arrived 2 hours b/4 check in and we hurried up so they could occupy the lodge and quest cottage and start their vacation..We are glad they had a good time. As for the washer , they were informed b/4 they rented it was not available.Our cleaning service and hot tub service will vouch as to the condition they left the cottage in which it took extra time and persons to clean..The kitchen in the lodge was furnished with new equipment. and is replaced as needed.There is 2 grills , one was clean , the gas grill was the last thing we clean and because of their early arrival we forgot to clean it. Sorry. Lovely Beach House - great place to get away! We've stayed at this property for the last six years and each time had a fabulous experience with both the larger log home and the smaller cabin that is also located on the property. The Log home is well maintained, clean, has a fabulous area to cook in that overlooks the grate room and dining room with a beautiful view of Walloon Lake. The listing is not accurate in terms of amenities, as there are MANY that are not listed. From Brose surround sound, to two first floor master suites with their own private bathroom, a gorgeous state of the art hot tub (We were there after the struck by lightning incident and the brand new hot tub cycles through pretty lights which the teens in our party loved), a large 1,000+ square feet loft that has two sets of bunk beds, a cozy viewing area for TV that the kids can relax and enjoy, a game area, mini nook near a well lit window for the readers to enjoy, another cozy area that has a big screen tv- apart from the kids loft, but close enough to hear if there are any "issues" in the other room, and two more bed rooms upstairs. Since we've been coming here for 6 years we've gotten to know the Browne family very well and been very pleased with the friendly customer service they've provided. Barb and Booth are retired and spend part of the summer at Walloon Lake, so they're always up on the latest restaurants and can make some good recommendations. One of our favorite places to go to is Jespersons in down-town Petoskey. Great, amazing coconut cream pie - we've been going there for years and usually make Jesperson's one of our first stops. Good burgers and the coconut cream pie is amazing! A previous review was upset they could not use the washer and dryer- while we agree this would be great, we also know and understand up front that it is not available. Our family and my brother and sister and their kids have all been coming up to this area for years. We're very glad to have found this beach house and plan on continuing to come back as long as the Browne's have it available for rent. We had the most wonderful time staying at the beautiful '4 year old' log mansion. We have stayed several years over the 4th of July and have been totally pleased. The house is amazing! It has a beautiful view of Walloon Lake with a porch to sit on that overlooks the lake. There is a nice sandy beach that my kids enjoyed playing in and looking for petoskys on the shore. The hot tub was clean, large and totally relaxing! Each of the bedrooms had rustic wood bedposts and were decorated adorable. Lots of space and two big screen TV's to enjoy. The small quaint cottage next door was decorated with cute fisherman décor and was very homey. Both cottages were very clean and well maintained. Very much enjoyed renting the large pontoon boat to tour the whole lake. The lovely couple who rent the cottages were very friendly, gave great advise on where to go out to eat, and willingly gave back the deposit with no trouble. I very much recommend staying here and look forward to coming back again this summer! antique festivals, Venetian festival, etc.